Tune-in to WOL 1450 AM on Thursday, September 24, at 10:30 am, for Everything Co-op, hosted by Vernon Oakes. 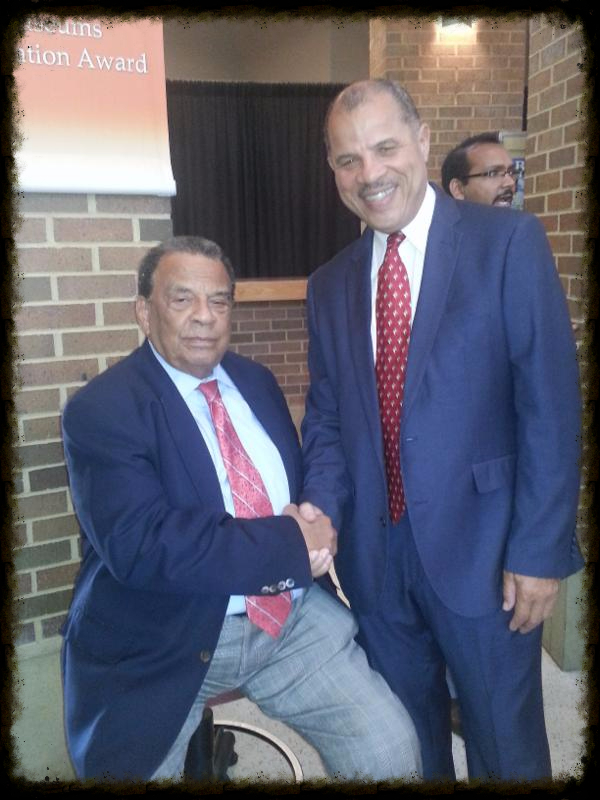 This week Vernon interviews Ambassador Andrew Young, Principal and founder of the Andrew J. Young Foundation. Vernon and Ambassador Young will discuss the role he and his Foundation has played in the advancement of the cooperative business model to create economic security for ALL, and the work that is ahead to improve lives and restore dignity. Andrew J. Young has lived his life in response to a call to service he heard as a young man. From his ordination as a minister, to his work on behalf of civil and human rights, to his public service career as a member of Congress, U.S. Ambassador to the United Nations, and Mayor of Atlanta, he has always answered the call to serve Today, the Andrew J. Young Foundation builds on his legacy by developing and nurturing new generations of innovative leaders to tackle this era’s global challenges. He has shared his life’s work in three books including: “A Way Out of No Way: The Spiritual Memoirs of Andrew Young,” “An Easy Burden: The Civil Rights Movement and the Transformation of America,” and “Walk in My Shoes: Conversations between a Civil Rights Legend and his Godson on the Journey Ahead,” which was co-authored by Kabir Sehgal. To learn more about Ambassador Young, or the Andrew J. Young Foundation Click Here! P.S. Unfortunately, due to personal circumstances Ambassador Andrew J. Young will not be able to appear on the show tomorrow. However, we are pleased to announce that Ms. Erma Wilburn, Civil Rights Activist and VISTA Volunteer will appear. Vernon and Erma will discuss her role in the Civil Rights Movement, and the worker-owned baking cooperative she is planning at this time. Erma Wilburn is working as an AmeriCorps VISTA (Volunteers in Service To America), and supports programs and initiatives of the Southwest Georgia Project for Community Education, Inc. VISTA Volunteers serve in nonprofit organizations or local government agencies around the country that focus on addressing the issue of poverty in America. VISTAs provide service in many different capacities: implementing literacy programs and tutoring for underserved children; coordinating volunteers; creating businesses; organizing employment training programs; addressing issues of hunger and much more. Ms. Wilburn started working on Civil Rights and Social Justice issues throughout Georgia at the tender age of fourteen, under the tutelage of her Aunt Atty, and State representative Mary Young Cummings. Due to her involvement in the Civil Rights Movement and her refusal to say the Pledge of Allegiance, she was expelled from school. She states: “I found it impossible to say the Pledge of Allegiance after spending time in jail for going to a public library.” Fortunately, being expelled gave her an opportunity to attend a preparatory school in Lenox, Massachusetts, which changed the trajectory of her life. After graduating, she returned to Georgia in 1971, attained her RN Degree, and continued working on voter registration and civil rights issues that concerned her community. Later she became a part of New Communities, a 5,700-acre land trust and farm collective, owned and operated by approximately a dozen black farmers from 1969 to 1985. It was once one of the largest-acreage African American-owned properties in the United States situated in Southwest Georgia. Today, she is in the planning stages of establishing a worker-owned baking cooperative, to address the high employment issue among Black Women in her region.